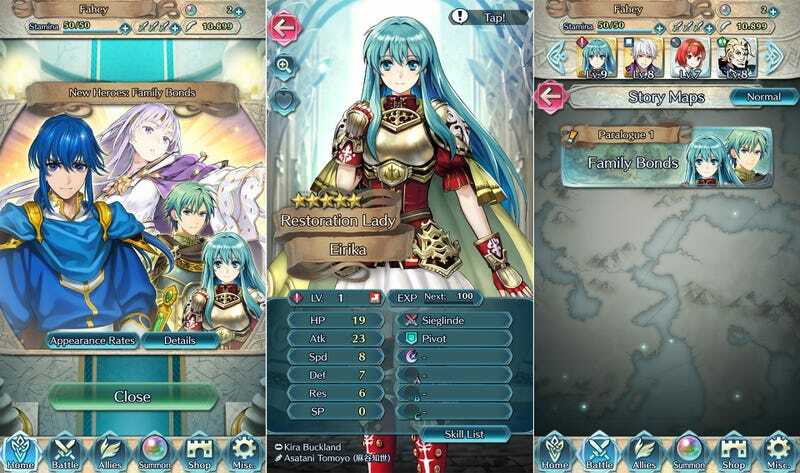 Just when you thought it was safe to stop summoning characters in Fire Emblem Heroes the first major update hits, bringing for new sibling characters to the game, along with a limited-time series of Paralogue quests celebrating their family bonds. The launch summoning focus events have ended, making way for the Family Bonds Summoning event. Brother and sister teams Ephraim and Eirika from Fire Emblem: The Sacred Stones and Seliph and Julia from Fire Emblem: Genealogy of the Holy War are now up for grabs. Along with the new crazy pairs comes the first series of Paralogue story extension maps, a trio of battles featuring the new characters in action. Players can also complete a series of Family Bonds missions for special rewards. I’ve managed to snag Eirika so far, but she’s awfully lonely without her brother. Dammit, Nintendo.